Re-piping is a process of replacing the supply pipes in a dwelling or business. It is not a temporary fix or a replacement of short sections of pipe, but a complete replacement of your supply plumbing system. There are several reasons you may need to re-pipe your home or business. Corrosion of pipes may cause low water pressure, rusty colored water, reduced water flow, or leaks. If you are going to remodel it is a good time to re-pipe before you paint or finish your walls. It is important to understand the scope of the project before work is started. If you notice an isolated leak or a small portion of your existing piping leaking, or valves that are corroded or cracked, it is quite possibly an indication of a larger problem. Re-piping is a process of installing a new copper re-pipe system. 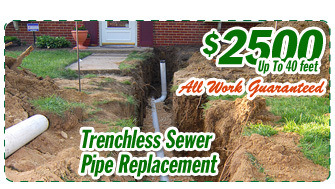 This process usually includes removing old readily accessible pipe and then installing the new plumbing system. Included in the process is the installation of new USA type "L" hard copper, properly strapped and secured, install kwik 1/4 turn ball type water stops, install new stainless steel water supply lines. After the new piping system is installed the water is turned back on, the system is pressure tested and then flushed out. The re-piping process takes 1-3 days to install the new piping system. After the actual plumbing replacement, there will be some required wall patching. A professional site inspection is critical to a successful re-piping process. Standard re-piping projects include installation of all new hot and cold domestic water piping from the water source to all existing faucets and fixtures. Unless specifically included in the proposal, drain replacement and fixtures are not included. There are various materials used in re-piping, in water supply re-piping some of the materials are metal and perhaps some plastic pipes. The metal pipes are galvanized steel or iron, brass, and copper. The plastic pipes are Poly Vinyl Chloride PVC, Chlorine Poly Vinyl Chloride CPVC, Poly Ethylene PE, Polybutylene PB, and Kitec. Most of these plastic pipe systems will end in lawsuits. Part of the problem is with the fittings that are often cheaply made with little quality control by a verity of overseas companies. Plastic pipes also have questionable joining methods. Plastic pipes are glued, crimped, and banded. When plastic pipes blow a joint they blow apart and result in water damage. Plastics become brittle with age and heat. There are also issues about the molecular structure of plastics and the resins from which they are made. In rare instances a CPVC re-pipe maybe recommended where the water PH levels are a problem.